You know, it can be really frustrating, but Japanese gamers so often seem to get a much better deal than European, or even US gamers, frequently receiving extras that the rest of us have to do without. A good example of this was the Satellaview system for the Super Famicom (SNES). Looking much like the proposed SNES CD-ROM add-on, the Satellaview was a device that allowed Super Famicom owners to download updates for some of their games, or even new games altogether. 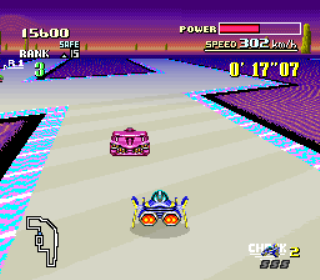 They were usually released in weekly installments, and one of the highest profile games to receive the Satellaview treatment was the mighty F-Zero. Initially, a limited ‘remix’ of the original game was released in several installments via the service, but before long a ‘proper’ sequel became available too. 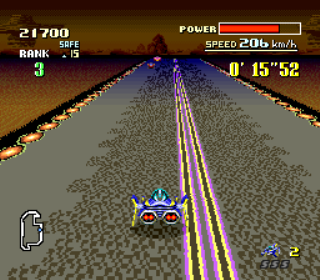 As F-Zero fans will already be well aware, the first game consisted of fifteen courses divided into three leagues – Knight, Queen, and King. 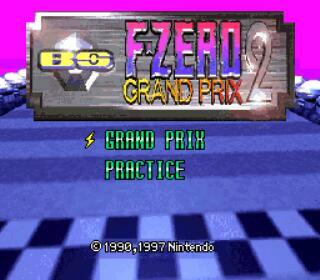 F-Zero 2 features a new league – the Ace League – which features five new courses. Some are based on courses from the first game (such as Mute City IV, Big Blue II, Silence II) but with new course layouts, whilst the other two (Sand Storm I & II) are seemingly based on the Sand Ocean stage from the first game, thematically, but are completely new. In keeping with the league structure from the first game, the new courses are probably the most difficult ones yet too. Each features many more hazards than were found in the fifteen F-Zero courses such as damage areas, more ice, magnets, and many ramps, often in highly inconvenient positions! In addition to the courses, the four selectable craft, or ‘machines’, are all new too. Well, saying that, they’re just aesthetically new really, but are welcome all the same. This release was obviously fantastic news for any Japanese F-Zero fans but it went practically unheard of in the West, which is a bummer – I’d have loved having this available during the peak of my obsession with F-Zero but I only even discovered its existence a few years ago! 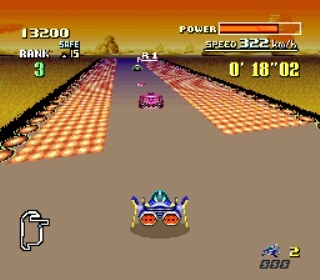 It may have less to it that its prequel (due, no doubt, to the limited service it was made available on) – there’s just a straight grand prix mode, for example, with no time attack or practise modes on offer – but as a supplement to the original game rather than a separate game in its own right, it’s great. The new courses are really nicely designed and the features on them (a couple of which are shown in the screenshots) are a great touch, adding a unique feel to the game. It’s particularly nice returning to two of my favourite course settings too – Big Blue and Silence. It’s been a pleasant surprise discovering this. I can’t help wishing it was available in the West before emulation became widespread but I’m sure glad I can play it now. Admittedly, aside from a few cosmetic changes, it is of course the same game we’ve known and loved all these years. Only harder! It won’t last you as long as F-Zero but it’s a thrilling ride while it does last!